Philip Edward Thomas was born on 3 March 1878 in 10 Upper Lansdowne Road North (now 14 Lansdowne Gardens – where he is remembered with a blue plaque) and died on the battlefields of Arras, France on 9 April 1917. 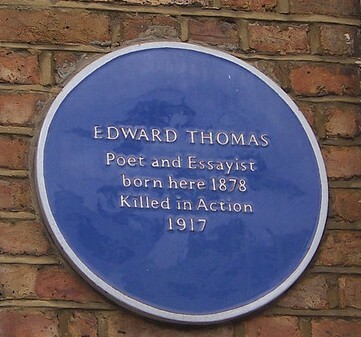 Thomas was educated at St. Paul’s School, London and Oxford University. An unhappy and solitary person, he earned a living as a writer and journalist mainly on nature issues and 19th-century writers. In 1913 he met the American poet Robert Frost who encouraged him to try writing poetry. 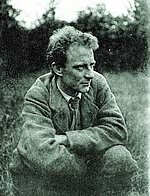 Much of his poetry was written after he joined the Army in 1915 and was only published after his death, although some was published under the name Edward Eastaway during his lifetime. His poetry is predominantly about nature and is noted for its quiet, unstressed, rhythms. His work has a fresh, unromantic feel, often with a melancholic, solitary atmosphere.